Note: This Blog is written by a Guest blogger, Jodi Clock, my wife. She writes her own blog, Ask Jodi, which can be found at jodiclock.com and the Author of the very informative book “Navigating the Eldercare Journey Without Going Broke” which can be found on Amazon.com. The story told below was experienced by all of us here at the funeral home. It shows some of the challenges that can happen when trying to do things on the internet. Buying shoes online is one thing. Making cremation plans for your deceased mother is a completely different. I hope you find this post informative. The following is a true story. You will read about one local family’s experience that thousands of people across the country who want a “simple” cremation fall victim too. The names of the family have been changed, but the name of the the cremation provider is actual. The story was not embellished. Sam died peacefully at home under the care of hospice on a Sunday morning in Grand Haven, MI. His wishes were to be immediately cremated and returned to the family for burial at a future date. Having grown up in the great depression, he was adamant about spending as little money as possible for a cremation. Written instructions were left requesting his family not spend money on an obituary, memorial service, flowers, even an urn. His intentions were to ensure that his wife of 65 years would have enough money to live comfortably. Together his wife, Mary, and their seven children agreed to honor his final wishes. The day that Sam died, their oldest child, Karen, began price shopping for a cheap cremation. Like most baby boomers, she turned to the internet. The key words used in the search engine were “cremation providers in Grand Haven, MI.” As you would suspect, after the paid ads, all the area funeral homes appeared, followed by a list of “non-funeral home” cremation society imitators who not only advertise on low price, they give the appearance to be local. Therefore, if price is the driving factor and the service appears to be local, the average person would make the assumption that the service provider was the solution for their situation. After all – how difficult could a “simple” cremation be? Or so you would think. Here in lies the problem. Karen chose to call Heritage Cremation Provider strictly based on their website. She called what appeared to be a local phone number. What she encountered on the other end, unbeknown to her was a call center that was re-routed someplace else. The voice on the other end of the phone took the necessary information and shared that they would get back with her regarding when to expect someone to come pick up her father. In the meantime, she was told that they would need signatures from all of Sam’s children on a cremation authorization before the cremation could take place. The form was to going to be emailed to her. By federal and state law it necessary to have a funeral home/director be accountable for the above responsibilities. Heritage Cremation Provider then hired a local funeral home and called the family back. They said someone would be there within the hour to pick up their father. Shortly a removal team arrived at the house and brought Sam to the contracted funeral home’s care. Karen didn’t understand the paperwork and Heritage Cremation Provider could not answer her questions satisfactorily. This communication debacle resulted in a two-week delay of Sam’s cremation. With no success, the contracted funeral home on a daily basis called Heritage Cremation Provider trying to obtain the information necessary in order to get things done. Finally, after 14 days the contracted funeral home demanded that Heritage Cremation Provider give them the family’s contact information as they were going to take matters into their own hands. The contracted funeral home’s director was able to reach Karen and discovered that Sam was married and had a surviving spouse. The director explained that by law, the surviving spouse is always considered to be the next of kin, unless there was a pre-appointed funeral guardian assigned prior to death. This provided relief for Karen as she was trying to reach all six of her siblings to sign the cremation authorization. It was abundantly clear that Karen was angry and distraught, so the director asked her when she and her mother could come to the funeral home, sign papers and talk. Before the end of the day, Karen, along with her mother and another sibling, walked through the front doors of the contracted funeral home. Within minutes of sitting down with the director, the family began launching questions fast and furiously. Rightfully so, their emotions were running high and was fueled by grief and fear from the unknown. Karen hadn’t slept in days. She was having nightmares about where her father was, let alone how he was being care for. The visions in her head were those of a bad B rated horror film. No one understood why cremation hadn’t taken place after 14 days. After all, this was supposed to be a “simple” cremation. In a very gentle, but matter a fact manner, the funeral director addressed each concern the family had. The family’s biggest fear that Sam was not being cared for with dignity. No matter what the director said, they could not hear the answer between the sobbing and morbid visions they had in their head. In order to gain control of the situation the director had to address their two major fears. The first being the visual of Sam decomposing in some back alley and the second, that the cremated remains that they will now receive back will not be his. At this point, it’s not about finishing a “trade call” and gathering the right information to see the cremation process out. It’s about doing the right thing for two very important reasons: to provide the family the peace of mind necessary for them to begin to heal and showing the family that there are honest death care providers. Would you like to see Sam and say a final farewell? Would you like to be present and witness his cremation? By offering those two simple acts, the family’s anxiety level began to decrease. 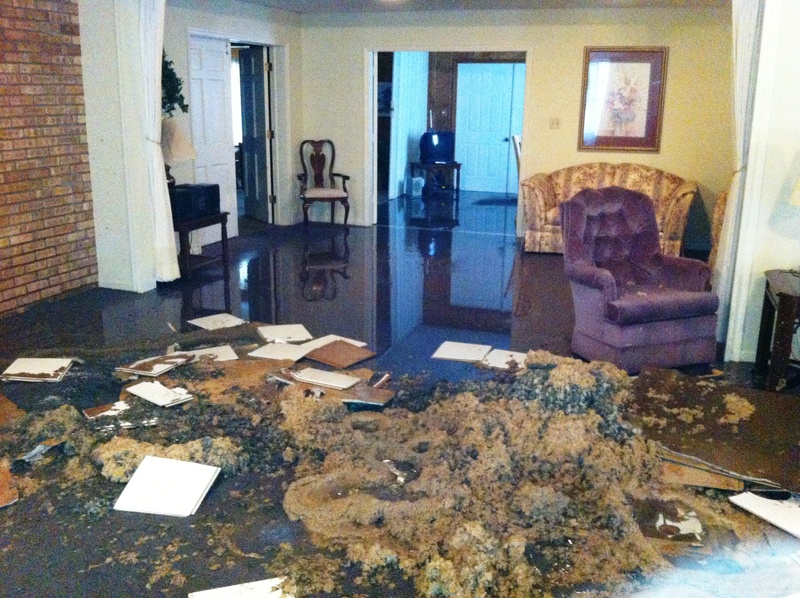 The family was apprehensive about what they would see and once again had numerous questions. The director explained that whatever they are envisioning, is not what they are going to see. Educational information was shared about cold storage and how it preserves a person’s body. The cremation process itself was explained from A to Z. They were told that their involvement could range from simply being present, witnessing Sam physically being placed in the cremator or even pushing the button to start the process. The family wanted to see their father. After few minutes, the director escorted them into a visitation room where Sam had been placed. The funeral home’s care team, closed his eyes and mouth, combed his hair and placed a pillow under his head and a blanket over him. Why? Because that’s what a funeral home does. Funeral directors know that if there is visual contact, there was nothing to fear and the family will start to heal. The family spent about 15 minutes privately with Sam and then thanked the funeral home profusely. They said they did not want to be present when the cremation took place. They just wanted to know a “when” it would occur. When the director asked why they did not want to witness after everything they had encountered over the past two weeks. Both Karen and Sam’s wife said that they trusted the funeral home. Before leaving, Karen completely melted down and was asking for her family to forgive her for choosing Heritage Cremation Provider. She expressed she had no idea what all was involved in a “simple” cremation, nor did she realize the value a funeral home and or funeral director. She just wanted to follow her father’s wishes and not overspend. Her family was more than understanding. They made all the same assumptions. After all – the media and many other uninformed mediums portray funeral homes and funeral directors to be salesmen who prey upon families in their weakest time. In retrospect, who is preying upon families at a weak moment? A low-cost provider who over promises and under delivers or a funeral home? One could argue that this is an isolated situation. Facts, reviews and a little detective work will prove that this is more the norm than not. Yes, death care is expensive, but if you work with a reputable funeral home it doesn’t have to be unaffordable. Well regarded funeral homes will work with families so they don’t overspend. Every year the funeral trade magazines post numerous articles written by a handful of funeral home financial and marketing consultants like David Nixon, Dan Isard, Alan Creedy, Glen Gould and Bill McQueen just to name a few of the better known. They have provided the funeral home owners with vast amounts of great information through the years about sales averages, how to set up budgets, break-even analysis calculators and the like. We look to these folks to help us figure out what the future might look like and give us some “Normal” numbers to compare our numbers to. They have access to what people are doing around the country that most funeral home owners don’t have access to and we have come to depend on them to give us a “pulse” of what’s happening. Over the last ten years the funeral business has been changing so much that I don’t believe that we can say what is “normal” any more. Thirty years ago when the cremation rate was below 20% all over the country and most funeral homes provided the same type of service and merchandise to nearly every family they served it was pretty easy to say what was normal and average. But now with new low cost cremation providers, online funeral arrangements sites, and competition from hotels and reception facilities taking a larger piece of the pie every year what’s normal for me may not be normal for someone else. I think it’s time for all of these consultants to go back to the drawing board, put their thinking caps on and come up with some New Normals for us to compare things to. They need to realize that there are now multiple sets of normal numbers depending on cremation rate, market population, religious and ethnic background, and the number and type of competitors in your market. There is no “one size fits all” any more. What is normal for a town of 50,000 people with 50% cremation, 3 traditional funeral homes, 2 low cost cremation providers and a large population of church members? What is normal for a college town of 120,000 with 65% cremation, 2 corporate funerals home/cemetery combos, 3 independent funeral homes and 4 low cost providers and 2 online arrangement providers? What is normal for a 600,000 population big city with Ethnic firms and Religious firms and corporate firms and independent firms of all shapes and sizes? How many low cost providers can exist in a town like that? Do Online arrangements sites really work or are they just the latest thing the vendors are trying to convince us all we need. The places in the country that have been dealing with 70% cremation for a long time are the folks the rest of the country should be hearing from and learning from. What is their reality? What kind of average sale do they have? How are they surviving and thriving? What did they do when their call volume remained the same but their annual revenue dropped by 25% because people were choosing less expensive options? I’m guessing that over 50% of the funeral homes around the country saw their average income per call decrease last year (that’s all calls, cremation and burial calls, combined). SCI just reported that their average income per call dropped last year. With all due respect to the folks in the middle of the country who are still doing 80% burial or big city ethnic firms where people drop $15,000 regularly on a funeral, I don’t even want to talk to them. They are not in the same business as me. And I’m not so sure the start-up guys in the big cities that are carving out a “hip and new” niche market for themselves can really relate to what it’s like in a market with a steady population and a blue collar income where people are just trying to get by. There are only so many deaths in most markets and only so many dollars that people have to spend. So…. All of you Mr. Smarty Pants people out there what is the new normal??? Last fall I wrote a blog entry about our new venture at our Fruitport, MI location called Sunset Celebrations. I told you that we were converting our existing funeral home into a facility that was capable of hosting different kinds of family oriented events like Graduation Open Houses, Birthday Parties, Retirement celebrations, baby showers and other similar events in addition to the Funerals and Memorial Services and Celebrations of Life. I used the words Event Center to describe the facility, because that’s what’s it’s purpose was now. A place to hold family events. Since we re-opened in September we have hosted a wedding reception, a Retirement Party, a Company Christmas party, an Anniversary party, two Memorial Services, two Funerals, several business meetings and a Vendor party where local Tupperware/Avon/Amway type folks displayed their products. They were all very successful events and everyone was very happy with the facility and we were receiving new calls every week to reserve the facility for events in the spring and summer. Then in January we got a letter from the Village of Fruitport Building Inspector telling us to cease and desist from hosting events other than “funerals” because we were zoned as a funeral home and not as a Banquet Hall. The only major difference between the two zoning rules was that a Banquet Hall required 2 acres of land and a funeral home only requires one acre. Plus there is nothing in the funeral home zoning rule that prohibited us from hosting other family events. But in an effort to be good neighbors we stopped taking further reservations and started efforts to resolve this issue with the Village Council so we could continue to serve the demands of the public. Now we have run into some major challenges with definitions and words. What is the definition of a Funeral? What is the definition of a Memorial Service? What is a Celebration of Life. What is a Home Going Celebration? What is a Farewell Party? The fact is each one of the events I just listed are family gatherings recognizing a marker moment in someone’s life. Each one of those events is a gathering of people in a building where there are tables and chairs for people to sit around. Food and beverages are typically served. There are photographs displayed and videos shown on TV’s. There is often a microphone so everyone can hear the stories that people want to share with each other and there is music for all to hear. There is a parking lot for cars and restroom facilities for our human needs. Those are the basic elements and activities of every one of those events. Now, let’s think about retirement parties and graduation open houses and anniversary parties and baby showers and wedding receptions. The fact is each one of the events I just listed are family gatherings recognizing a marker moment in someone’s life. Each one of those events is a gathering of people in a building where there are tables and chairs for people to sit around. Food and beverages are typically served. There are photographs displayed and videos shown on TV’s. There is often a microphone so everyone can hear the stories that people want to share with each other and there is music for all to hear. There is a parking lot for cars and restroom facilities for our human needs. Those are the basic elements and activities of every one of those events. I hope you noticed that the italicized words describing all of those events are exactly the same. The exact same thing happens at each and every one of those events. I ask this rhetorical question. So…Is my newly remodeled facility a Funeral Home that also hosts Family Events or is it an Event Center that specializes in Funerals and Celebrations of Life? And does it really matter? I feel that if the Council of the Village of Fruitport wants to continue to have a local funeral facility to serve their community they need to seriously consider changing their rules to adapt to the future realities of funeral service. Nearly every Funeral establishment in our area now offers some type of reception services. It’s what the public wants. It only makes sense to allow us to host other family events too. I’d love to hear what the rest of you out there think of this issue. 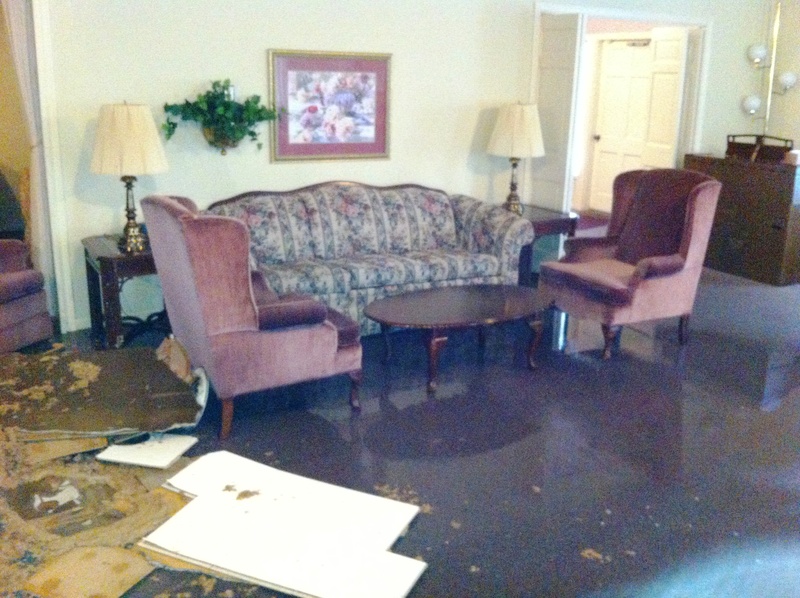 Last November we had some major water damage at the Clock Funeral Home facility in Fruitport, Michigan. It is a small facility (2500 sq ft with no basement) that we only have staff at when we are meeting with families or having visitations and funerals. We check on it regularly but it is not uncommon for there to be 5 day stretches that no one is in the facility. It seems that the furnace starter failed and the building was without heat for a while. It was also a matter of fate that we had an unusual early cold snap during that period. When we discovered the problem with the furnace we had it fixed, turned the heat up and left the building. Three days later our parking lot snowplow guy was clearing the snow and called us to say there was water running out from under the door. Not the kind of news you want to hear. What had happened was that the water pipes that run through the ceiling had frozen and cracked during the cold snap when the furnace wasn’t working. And when we turned the furnace back on it thawed out the pipes and the water started spraying water in the attic space above the ceiling. 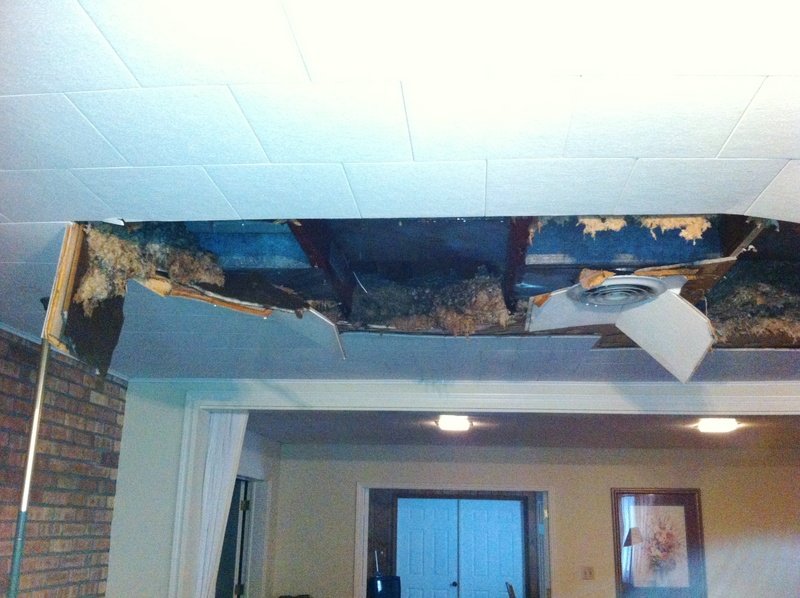 It eventually soaked the drywall and tiles and the ceiling came crashing down on the furniture. The water then continued to run for 3 days before it was discovered. Here are some pictures. This brought to us a major dilemma. This branch was small and didn’t have good bathroom facilities. The layout wasn’t good for larger crowds and we had shifted all of our body preparation to our main facility in Muskegon over 15 years ago. The business volume in Fruitport had been slowly declining for a few years and we wondered if it was worth it to repair the place at all or just close the facility down. We will still be able to hold funerals, visitations and memorial services just like before. 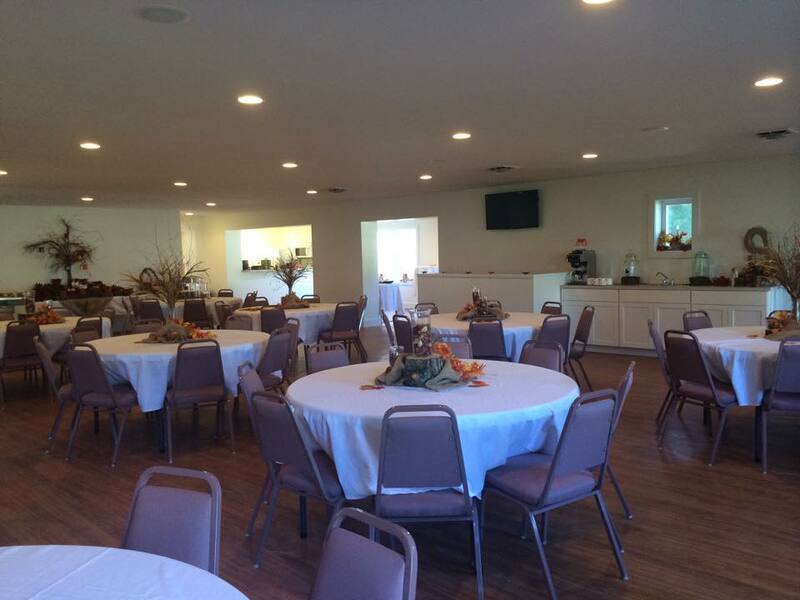 But now the facility has an open floor plan, with a sound system, TV’s on the walls and a small serving kitchen so we can hold any type of event that folk’s desire; wedding receptions, birthday and anniversary parties, graduation open houses, business meetings and baby showers. We are working with area caterers to provided food for events. The facility can comfortably handle crowds of up to 125 people depending on the layout. We are finally ready to reopen the place. Which is good because we have our first wedding reception there this weekend. And the road in front of the building which has been completely torn up for the last 4 months for a new sewer project will be open too. I’ll post photos soon. Almost everyone in funeral service is searching for a simple answer to the main challenge that faces most of us. And from that question come many more. Why are people choosing cremation more? Why are people choosing simple cremation providers instead of traditional funeral homes? What types of services and products do people really want? What can we do to be relevant in people’s minds? How are people getting the information they use to make decisions? Etc. etc. etc. We are all in search of the “Secret Sauce”. The one magic thing that when we do it, or buy it, or install it, that “Secret Sauce” will solve all of our problems and transform us back into a business where things were normal and regular. A business where we knew what people wanted, we gave it to them, they paid us and we all made money (by accident) and everyone was happy. Well I’m going to tell you right now that I don’t have the recipe to the “Secret Sauce”. So you can stop reading this article if that’s what you were hoping for. Life isn’t that simple. It never was. I’m writing this to let you know that you’re not alone out there in your search. I was originally going to tell you about some of the things that I have tried over the last 25 years. What kinda worked and what didn’t. So I started listing everything I tried. The list kept growing until I reached over 60 different things. Some of the things we tried we are still doing. Many things came and went. If I showed you the list you’d get bored halfway through it. I wish there was an easy answer, but there isn’t. I’m guessing it’s a combination of many ingredients. And the ingredients will be different for different size firms in different parts of the country. It’s no longer a one size fits all. I’ve attended numerous classes and seminars and I’ve heard some great ideas. But not all the ideas seem to fit with my philosophy. Not that they are bad ideas, just not a fit for me. The biggest challenge that I see for most firms is to get the whole staff united in one direction. For 10 years I have been trying to move my folks where I think we need to go. Some folks have followed, some folks have left, some folks have died, some have retired and some wish I’d stop trying new things and just go back to doing things the way we used to. If I was the charismatic leader that we read about in business books I would make wonderful speeches and lead my supportive troops into battle. But I’m not that kind of guy. Like many funeral directors, I am a pleasing accommodator that tries to avoid conflict. I can try to change some but, at 57 years old, I don’t see myself becoming a Lee Iacocca any time soon. So I’ll keep refining and honing my message to my troops and to the public. I still believe that the true vale of a funeral is the gathering together of people and the sharing of stories. It’s my job to help people gather together and help them share their stories and hear the stories of love and support from their friends and family. Everything we do at the funeral home has to focus on those two activities. And if they do, we will continue to serve the people for years to come.